Television magazine's TV Fault Finding column is a unique forum for practical servicing tips, with the UK's leading service engineers and servicing writers contributing their observations and recommendations month by month. But try finding those faults reports for the Amstrad CTV2200 that's on your bench. Even with an index you will be chasing through a pile of magazines... until now. 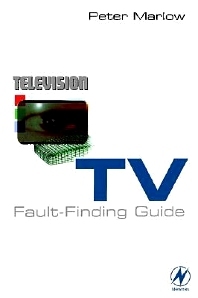 Peter Marlow's TV Fault Finding Guide is a distillation of the most used fault reports from 11 years of Television magazine. Arranged by make and model the information is extremely easy to access, and the book is a convenient size for the bench or to carry with you. This will undoubtedly become one of the service engineer's most useful tools. Unlike other fault guides, this one is based on top quality information from leading authorities, and genuine repair case studies. This is real-life servicing information, not just a compilation of manufacturers' manuals.